New York, Apr 12, 2006 - Not afraid to get dirty, Jeep® today revealed the all-new 2007 Wrangler Unlimited from underneath six tons of mud. Outside of the Javits Center, the beginning of the Jeep press conference featured only a simple mound of mud on stage, but quickly became one of the dirtiest vehicle reveals in New York International Auto Show history. Within minutes, a fire truck roared in with sirens blaring. 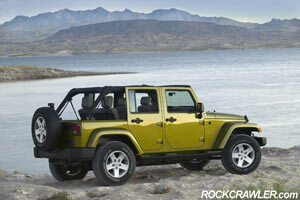 Several individuals emerged from the truck and blasted mud off the first-ever four-door Wrangler. When uncovered, Jeep's classic American icon debuted with a radical four-door open-air design — the all-new 2007 Jeep Wrangler Unlimited. The mudslinging didn’t stop there. Jeep also made a splash with the world debut of the all-new 2007 Jeep Patriot. 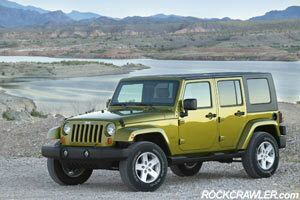 Executives christened the newest, most capable and most affordable compact SUV into the Jeep lineup. But forget champagne. Jeep Patriot wants to get dirty, so the crowd got into the mix, dumping barrels and balloons full of mud onto Patriot to give it a proper welcome to the Jeep brand. "In true Jeep fashion, we decided to get outside and play in the mud to introduce the all-new 2007 Jeep Wrangler Unlimited and 2007 Jeep Patriot," said Joe Eberhardt, Executive Vice President – Global Sales, Marketing and Service, Chrysler Group. "No other vehicle in the world can replicate the Wrangler Unlimited's unique combination of four-door convenience, open-air driving experience and unmatched off-road capability. 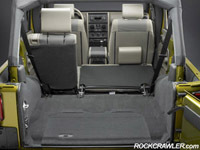 And no other vehicle in the compact SUV class can match Patriot's price or capability." Featuring a one-of-a-kind, four-door open-air design, the all-new 2007 Jeep® Wrangler Unlimited expands the Jeep experience to new dimensions. With room for five adult passengers – a Wrangler first – and the most cargo space ever offered in a Wrangler, the Unlimited combines class-leading off-road capability with everyday practicality. The all-new 2007 Jeep Wrangler Unlimited features a 116-inch wheelbase, achieved by adding 20.6 inches to the standard all-new 2007 Wrangler’s 95.4-inch wheelbase. The additional length allows for a larger rear seat that features three seating positions, as well as more hip, leg and shoulder room. 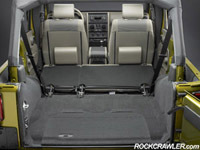 In addition, Wrangler Unlimited offers nearly triple the rear cargo space. Offered in two-wheel drive and four-wheel drive, Jeep Wrangler Unlimited utilizes the same five-link solid-axle suspension configuration as the standard 2007 Jeep Wrangler. 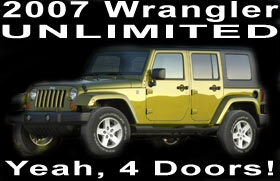 The all-new 2007 Jeep Wrangler Unlimited also retains Wrangler’s coveted removable full-framed or half doors, exposed hinges, fold-down windshield and innovative removable and convertible tops. While maintaining its legendary off-road capability, the all-new 2007 Jeep Wrangler Unlimited features a spacious interior that takes comfort and convenience to new lengths. Its 102.9 cu. ft. of total interior space provides room for five adult passengers and delivers more cargo storage and seating configurations than ever before. Providing easy entry and exit, all four doors on the all-new 2007 Jeep Wrangler Unlimited are front-hinged, with inside and outside handles, and windows that travel all the way down. Rear doors feature exposed forged hinges, open a full 90 degrees, and provide a 26.5-inch wide opening. The all-new 2007 Jeep Wrangler Unlimited offers rear-seat passengers a 33-inch front-to-rear couple distance and 37.2 inches of legroom. Rear seats split 60/40, and easily fold flat, creating 83 cu. ft. of total storage volume. 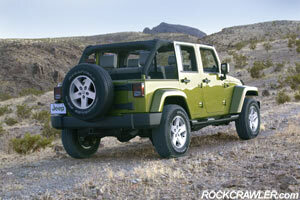 With rear seats in the upright position, Jeep Wrangler Unlimited features 46.4 cu. ft. of cargo space behind the rear seat, providing more cargo space than the 2007 Toyota FJ Cruiser, 2006 Hummer H3 and 2006 Nissan Xterra. A new lockable underfloor storage area secures personal items out of sight. Identical to the standard all-new 2007 Jeep Wrangler, Jeep Wrangler Unlimited features an all-new instrument panel, center stack and high-back front bucket seats. The front-seat area provides 54.6 cu. 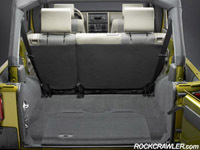 ft. of space, providing 5.1 inches more shoulder room and 4.6 inches more hip room compared to 2006 Jeep Wrangler models. An all-new, three-piece modular hardtop – Jeep’s Freedom Top™ – features three removable panels for a variety of open-air driving configurations. The left- and right-front passenger panels may be stored inside the vehicle, while the rear section can remain in place or be removed separately. The all-new 2007 Jeep Wrangler Unlimited also features a standard Sunrider™ soft top, which includes a “sun roof” feature as well as the full top-down option. This soft top provides a second open-air option by folding the soft top back completely over the first- and second-row occupants, creating a 55x60-inch sun roof opening – an opening 30 inches longer than the standard 2007 Jeep Wrangler Sunrider top. Even with the additional 20.6-inch wheelbase length, the all-new 2007 Jeep Wrangler Unlimited achieves off-road leadership among all SUVs in its class. Superior ground clearance combined with short front and rear overhangs enable Jeep Wrangler Unlimited to navigate the most rigorous off-road trails. The all-new 2007 Jeep Wrangler Unlimited features a best-in-class approach angle of 44.4 degrees, breakover angle of 20.8 degrees, and best-in-class 40.5 degree departure angle – all more than worthy of negotiating extreme obstacles. Additionally, Jeep Wrangler Unlimited offers an available electronic-disconnecting front stabilizer bar – Active Sway Bar System (ASBS) – delivering a 28-percent increase in wheel travel. The highly capable underpinnings of Jeep Wrangler Unlimited X and Sahara models include an enhanced Dana 30 front axle and Dana 44 rear axle – each featuring larger pinion shafts, pinion bearings and axle joints for increased durability compared to its predecessor. Engineered to take on the most demanding trails, the all-new 2007 Jeep Wrangler Unlimited Rubicon model features enhanced heavy-duty Dana 44 front and rear axles, which also feature larger pinion shafts, pinion bearings and axle joints. Providing armor for the all-new 2007 Jeep Wrangler Unlimited’s underbody components are three skid plates – protecting the fuel tank, transfer case and automatic transmission oil pan. 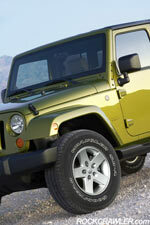 Two-wheel-drive Jeep Wrangler Unlimited models feature one skid plate to protect the fuel tank. Four-wheel-drive Jeep Wrangler Unlimited X and Sahara models feature the second-generation Command-Trac® NV241, part-time, two-speed transfer case, featuring a 2.72:1 low-range gear ratio. An optional Trac-Lok® limited-slip rear differential provides extra torque and grip during low-traction situations. The all-new 2007 Jeep Wrangler Unlimited Rubicon model features an Off-Road Rock-Trac™ NV241 two-speed transfer case with a 4.0:1 low-range gear ratio, as well as electric front- and rear-axle lockers, Active Sway Bar System and 32-inch B.F. Goodrich Off-road tires. The all-new 2007 Jeep Wrangler Unlimited features an even more refined on-road experience courtesy of its 116-inch wheelbase, all-new 100-percent stiffer frame, 50-percent stiffer body and refined five-link coil suspension. In addition, new steering and suspension geometry provides precise ride and handling characteristics, while new sound-deadening techniques reduce cabin noise by more than 20 percent. Standard on the 2007 Jeep Wrangler Unlimited X model, low-pressure twin-tube shock absorbers are tuned to match softer coil rates, achieving optimum balance between advanced on-road handling and rugged off-road capability. Jeep Wrangler Unlimited Sahara and Rubicon models feature standard high-pressure monotube shocks, utilizing Low Speed Tunable (LST) valve technology. New on all 2007 Jeep Wrangler Unlimited models is a 3.8-liter overhead valve V-6 engine, with 205 horsepower and 240 lb.-ft. of torque – producing more horsepower and torque than its predecessor with improved fuel economy. 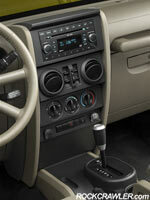 A standard six-speed manual transmission or an available four-speed automatic transmission is offered. 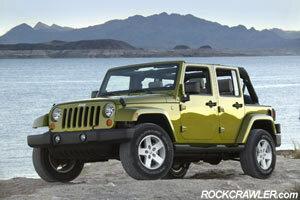 Jeep Wrangler Unlimited features a towing capacity of 3,500 lbs. and an optional towing package that includes a 4.10 axle ratio, class III trailer hitch and two front tow hooks. For key diesel markets outside North America, a diesel engine will also be available – for the first time in a Jeep Wrangler – with a five-speed manual transmission. The all-new 2007 Jeep Wrangler Unlimited takes on a radical four-door open-air design with Jeep-signature design cues – classic round headlamps, seven-slot grille, trapezoidal wheel flares and exposed forged hinges merged with Wrangler Unlimited’s longer wheelbase, front-hinged rear doors, exposed B-pillar and larger sport bar – creating a stance that commands attention like no other Wrangler in its 65-year history. Several Jeep concept vehicles – the 1997 Jeep Dakar, 2004 Jeep Rescue and 2005 Jeep Gladiator – that explored the combination of added space and utility with Wrangler’s rugged off-road character, inspired the all-new 2007 Jeep Wrangler Unlimited’s design. The all-new 2007 Jeep Wrangler Unlimited’s 20.6-inch longer wheelbase with full-framed or half rear doors is encompassed by taut lines, sharp angles and planar surfaces, appearing not so much styled as constructed. The result is a design that is simple, strong and purpose-built, giving Wrangler Unlimited a military quality: upright and rugged, and imposing without being intimidating. The interior design of the all-new 2007 Jeep Wrangler Unlimited draws from the exterior, with a straightforward, purposeful, yet contemporary theme that delivers a new level of comfort, spaciousness and convenience. Featuring a Slate Gray or Khaki interior, the all-new 2007 Jeep Wrangler Unlimited utilizes new grain patterns delivering a technical appearance with geometric themes, complementing its rugged exterior. The instrument panel features an all-new analog instrument cluster, four round airflow registers, six speakers and a 32-percent-larger locking glove box. Jeep Wrangler Unlimited’s tweeter speakers are located on top of the instrument panel and face each opposing occupant for optimal left- and right-channel clarity. The all-new 2007 Jeep Wrangler Unlimited’s center stack provides easy-to-reach controls for audio system, HVAC, power window and Electronic Stability Program (ESP) switches. An available 368-watt Alpine stereo with optional navigation system is located at the top of the center stack for better visibility. Radios feature an auxiliary jack for portable MP3 compatibility. Offering easy-to-use, comprehensive driving directions, Jeep Wrangler Unlimited’s available navigation system provides real-time guidance. In addition, a trail feature leaves behind a virtual breadcrumb trail that shows where the vehicle has driven off-road, enabling the driver to retrace the route and return to the trailhead. The Jeep brand offers customers “even more” with its expansion of rugged, versatile, innovative four-wheel-drive vehicles, further solidifying its standing as the global leader in the sport-utility market. Hot on the trails of the newly introduced 2007 Jeep Compass, 2007 Jeep Wrangler and 2007 Jeep Patriot, the all-new 2007 Jeep Wrangler Unlimited again underscores the brand’s commitment to its core attributes of freedom, adventure, mastery, authenticity and capability with its first-ever four-door convertible. The Jeep Wrangler customer is truly unique in that many have wanted a Wrangler for years. “I’ve always wanted one” is a commonly expressed sentiment. The all-new 2007 Jeep Wrangler Unlimited effectively grows Jeep Wrangler’s appeal by offering authentic off-road capability to those who desire more space and versatility. Jeep’s global lineup now includes Jeep Commander, Jeep Grand Cherokee, Jeep Liberty (Cherokee outside North America), Jeep Compass, Jeep Patriot and the legendary Jeep Wrangler and Jeep Wrangler Unlimited. 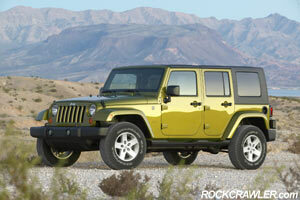 The Jeep brand continues to gain momentum, with 2005 sales up 12 percent over 2004. More than 400,000 Jeep SUVs were sold in the U.S. last year. The Jeep Trail Rated badge on the all-new 2007 Jeep Wrangler Unlimited verifies that the vehicle has been designed to perform in a variety of challenging off-road conditions identified by five key off-road performance categories: traction, ground clearance, maneuverability, articulation and water fording. Jeep Trail Rated is an industry-leading methodology that objectively measures and consistently predicts off-road performance for all Jeep vehicles. Through a combination of natural and controlled field tests, as well as computer-simulated environments, Jeep Trail Rated provides a repeatable and consistent measurement of off-road performance for Jeep vehicles. Only Jeep vehicles are Trail Rated. The all-new 2007 Jeep Wrangler Unlimited will be sold in more than 100 countries throughout the world, in both left- and right-hand-drive models. Wrangler Unlimited will be available with a new 3.8-liter V-6 engine and a diesel engine will also be available for key diesel markets outside of North America. 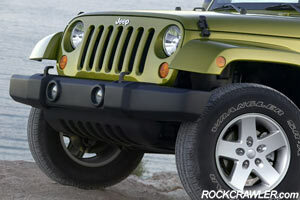 Built at Chrysler Group’s Toledo Assembly Plant in Toledo, Ohio, the 2007 Jeep Wrangler Unlimited will arrive in U.S. Jeep dealerships in the fall of 2006, and will follow to international markets starting in the first half of 2007. Coolant Capacity........................................................................................................ 13.36 qt. (12.64L) Std. Four-Wheel Anti-Lock with on- and off-road calibrations……......................................................................Std. Electronic Stability Program (ESP) …….......................................................................................................Std.